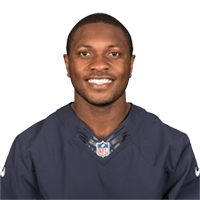 Published: Oct. 2, 2016 at 03:12 p.m.
Chicago Bears QB Brian Hoyer finds wide receiver Eddie Royal for a 64-yard gain. Published: Oct. 2, 2016 at 01:27 p.m.
Chicago Bears QB Brian Hoyer finds wide receiver Eddie Royal for a 4-yard TD. Published: Sept. 19, 2016 at 11:22 p.m.
Chicago Bears wide receiver Eddie Royal returns the punt for a 65-yard TD. Published: Sept. 11, 2016 at 02:30 p.m.
Chicago Bears quarterback Jay Cutler finds wide receiver Eddie Royal in the end zone for a 19-yard TD.